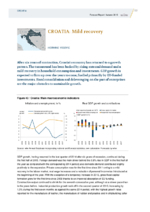 After six years of contraction, Croatia’s economy has returned to a growth pattern. The turnaround has been backed by rising external demand and a mild recovery in household consumption and investments. GDP growth is expected to firm up over the years to come, fuelled primarily by EU-funded investments. Fiscal consolidation and deleveraging on the part of enterprises are the major obstacles to sustainable growth.